Home / Archive / If the future of TV is online, why the concern over BBC Three? If the future of TV is online, why the concern over BBC Three? Online TV. It's a growing market, and research shows that children and teenagers have mostly ditched traditional linear TV in favour of online content. For grown-ups, the likes of Netflix and iPlayer have got more and more of us watching what we want when we want. So you may be able to see the logic in the BBC's proposals to move BBC Three online and enhance its overall presence through more activity on commercial social media platforms and adding third party content onto iPlayer. And all the rumblings from the BBC indicate that the move of BBC Three online would have come at some point later this decade if it wasn't for cost-cutting now. And that makes sense - at the end of the decade there will be major changes to digital terrestrial TV (Freeview) in the UK coinciding with frequency changes and by then most of the younger half of BBC Three's target audience will entirely be of the millennial online generation. So why should the current BBC proposals, which have recently been out for public consultation, be of concern? We're not yet all at the end of a fast broadband connection: A lot of 16-34 year olds in the BBC Three target age group have voiced their concern about missing out because they don't have a fast enough internet connection. Easy to forget this if you're fortunate to have superfast unlimited broadband, but there are many parts of the UK, including in some cities, where broadband speed is still lacking. This is likely to improve considerably though by the end of the decade, but in the meantime it's a distinct barrier. Shoving BBC Three content late night on BBC One or Two may not be the answer. It's the second time the BBC has ditched the same generation of viewers. If you were 12-14 years old nearly ten years ago, CBBC shut up shop for you. Out went Grange Hill and similar programmes as the service focused on a younger audience, and the BBC promised it would launch more programmes for teenagers instead. BBC Switch - the promised strand for teenagers launched in 2007, but was ditched in 2010. It didn't fare well, and the then Director General of the BBC suggested Channel 4 should be the public service broadcaster responsible for teenagers. Now you're in your 20s and you've been ditched again. And BBC Three programmes, according to the proposals, may not be a permanent fixture on other BBC TV channels. BBC Three is not just for teenagers! The BBC Three target audience goes up to 34 year olds, who have still grown up with regular TV. BBC Trust research last year indicated that the median age of a BBC Three viewer is in their early 30s. With a lot of the BBC's other channels focusing on mature viewers and a diet of knitting/sewing, baking, gardening, antiques and painting, attracting viewers averaging around 60 years of age, there's a massive age gap between the teenager friendly online strategy proposed by the BBC and the content on other BBC channels. Missed opportunity to enhance linear TV If BBC Three is to move online, it's a great opportunity to shake up the other BBC channels. There's nothing in the proposals to say this will happen and in fact shows such as Don't Tell The Bride are being revamped to cater for older people with its move to BBC One. The BBC Trust's own research concluded that BBC One 'played it safe' at primetime, and that the BBC needed to attract younger, less affluent audiences as well as those from minority groups. Currently BBC Three does this better than any other BBC TV channel. BBC Four in contrast is the channel of preference for wealthy older white people, according to the same research, but BBC One, Two and Four all attract the same age group (look how close they are in the graph below). The removal of BBC Three could provide an opportunity to reduce repeats on other BBC channels with BBC Three content moving across. Some BBC Three programmes have already moved to Two, but this may have happened anyway - if a programme is popular enough they get 'promoted' up the BBC TV portfolio, that's always been the case. Crucially, the proposals don't indicate much of a long-term change to the other BBC channels as a result of the planned changes to BBC Three, with BBC Three content on BBC One or Two likely to be short-lived. What about Live events? In 2013, BBC Three became the home of Women's football. The BBC has long trumpeted its role in promoting minority sports. BBC Three has also provided alternative coverage of the Olympics, the Commonwealth Games and Athletics. It's also the home of the Eurovision Semi Finals, Glastonbury, T in the Park and BBC Radio 1's Big Weekend. Where will these go? On a standard definition BBC Red Button stream? Or sidelined onto the Connected Red Button (surely ideal for extra coverage of events, but not sole coverage). 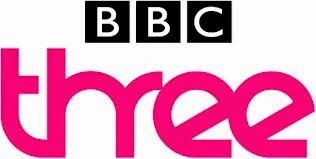 They plan to extend linear TV for 10-12 year olds and then ditch them Associated with the BBC Three proposals are plans to convert the first two hours of BBC Three's vacated bandwidth for use by CBBC. Despite the fact that CBBC's audience is falling and that research shows the decline in linear TV viewing is strongest among 4-15 year olds thanks to internet services, the BBC plans to extend CBBC to entice 10-12 year olds to linear TV and then cast them back to the online world when they turn 13. Unless they want to watch EastEnders or Doctor Who. Another timeshift channel? The BBC are wondering what to do with the remaining bandwidth vacated by BBC Three that isn't planned to be used by CBBC (i.e. 21:00 and later). The proposals indicate the possibility of launching another timeshift channel. Cost savings as a result of these plans appear to dwindle. Old people telling you what young people do* Tony Hall (BBC Director General) and Damian Kavanagh (Digital Controller, BBC Three), both well past the BBC Three target audience upper range of 34 years telling young people what and how they will watch the BBC, while services that appeal to their own age groups are protected. This and Damian Kavanagh's 'down with the kids' blog didn't go down too well and it was labelled 'patronising'. 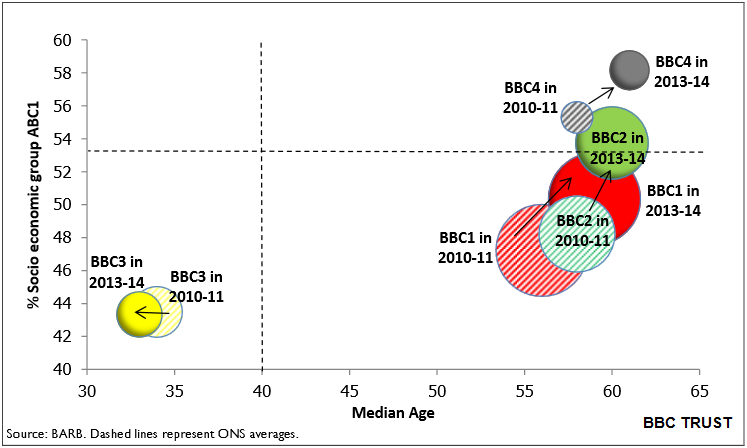 As mentioned before, the median age of a BBC Three viewers is in the early 30s - they're not all teenagers on tablets. *just as bad as young 'whippersnappers' telling old people how they should watch TV. There's no doubt that the long term future of much of what is on traditional TV is online. Rather than using this opportunity to improve a smaller, less repeat-dependent portfolio of traditional linear TV services - e.g. such as to liven up the remaining channels and commit to broadcasting programmes to bridge the age gap between 'tablet teenagers' and the over 50s over-catered for on the BBC, - there's no indication that much will change on the other BBC channels. And it appears to be odd to try and reach out to a generation that's already gone online, but take away services from those slightly older, who are still used to watching normal TV. It appears that unless you look like Tony Hall, are of the same age group, and share his interests, there might not be much to attract you to linear BBC TV services in the future outside of a small strand of popular shows in primetime. Want I don't like about BBC Three moving on-line. Is that I want to record stuff using my PVR and watch it when I want. Not have to watch it, within 30 days. Also my Internet is not that great. So if I watch stuff on-line, I can't use my Internet for anything else. Even when using the BBC iPlayer, I have to download the program or it just keeps buffering. Also the idea of moving stuff to the Red Button stream is pointless. I want to watch stuff in HD and not SD. Just to point out that the wholesale transfer of live events to the Red Button hasn't been confirmed by the BBC Executive; it's a question in the above article. Brilliant write up - that graphic sums it up perfectly.